Thanks to everyone who participated in this week’s Day in a Sentence. It continues to be a pleasure to see your words before the rest of the world and I am always truly honored by your posts. Larry (whose sentence I almost lost — sorry, friend) saw with his own eyes the continued aftermath of the storm. Lynn reminds us of the work that goes on behind the scenes by teachers and others to make sure our students have educational experiences. We’re often like the wizards in Oz, right? Jane comes into Day in a Sentence from Slice of Life and I am so happy to see her participating with us. She reflects on snow and perceptions. There are birds in the air (I, too, noticed the sounds the other day) that signal changes for Connie. Bonnie has been away and now is back home. In-between, she carved out a moment for her sentence. Ben B. had a full house (room) on a day of testing, showing that students know when it is time to skip and when it is time to stay. Elona reports from the north in a wonderfully poetic way. “The record snow fall we’ve had here in Mississauga, Ontario this winter is finally melting away this week in the warm sunshine and my thoughts this week turned to gardening. Boy, Anne sure has a full plate: family, friends and sheep (I think). Delaine finds solace in the regularity of the days. Eric sees spring right around the corner. There it is! No. Shoot, it disappeared. Wait! There it is! Amy, a newcomer to Day in a Sentence (welcome! ), also awaits the first signs of spring. Nancy was part of what sounds like a wonderful New York City Writing Project this weekend and like all technology-infused adventures, it had some moments that probably made her wish for pen and paper. Today’s Slice of Life is a convergence of communities. I write this as part of the ongoing Slice of Life project being guided by Two Writing Teachers but I also want to invite anyone and everyone to contribute to this week’s Day in a Sentence feature. After first settling in Australia, and then traveling off to Israel, the Day in a Sentence is back home here. If you are a regular Day in a Sentence contributer, I invite you to head over to Two Writing Teachers and follow some of the Slice of Life threads. If you are a Slice of Life friend, I warmly invite you to contribute some words to our Day in a Sentence feature. I’m realizing that I need to spend less time on the keyboard and more time in real life, and so, a little withdrawal is necessary. The Day in a Sentence continues on its world tour, moving from last week’s comfortable confines in Australia with Anne M. to the shores of Israel, where Bonnie is on her regular sojourn for a few weeks. Next week, the moon? No. We’ll bring the homesick Day in a Sentence home for a week of rest and relaxation after the visit to Bonnie’s blog this week. All that travel makes the Day a bit worn out, but loving the memories. And so, without further ado, Bonnie invites you to visit her blog and post your Day in a Sentence for this week, with any kind of vacation-themed writing you may to do. She even encourages the sharing of vacation photos. I decided to use a vacation-style metaphor for how things are going with me. You can feel free to twist the vacation idea any way that seems appropriate for you, of course. While my body feels as if it is in London — all dreary and foggy on the outside of the world — my mind yearns for some little tropical island somewhere that no one else knows about — restful and relaxed from morning until night. See you on Bonnie’s Blog! This week’s Day in a Sentence moves away from the continental United States and rests on the blog of our good friend, Anne M., from Australia. Anne invites you to join her Day in a Sentence adventure at her lovely named blog: ejourneys with technokids. Come along for the journey and boil your week down to a sentence (with the option of using a VoiceThread — which everyone should try) and then share with our ever-expanding community of teacher-writers. You are cordially invited, wherever you are and whomever you are. You know, you are an amazing group of writers. Here I am, throwing out the concept of boiling your days down into a couplet and you don’t blink an eye. You get down to it and start writing and start sharing and you blow me away every week. I am thankful for everyone who participated again this week. I am thankful to know all of you through your writing. I got a chuckle out of Sara‘s, as I know she has a birthday coming up (or has it come and gone?). where did the years go from 6th grade ’til now? the last birthday in the twenties, coming up – ka-pow! Mary brought us into her classroom. Mary is part of a new technology team that I have put together. Posters made to show all the actions! Anne H. has long been looking at how technology is both used and mis-used and she is a colleague at the Western Massachusetts Writing Project. What brave new world brings such notions? Doth not it seem yon English teacher is just a bit uptight? Perhaps grading those darn research papers hath kept her up all night. Jane is part of the Slice of Life blog project that I discovered and jumped into, and I am happy that that she posted for this project. But I am sad she is in a bit of pain. Derailed by the pain in my sore lower back. Grading! Grading! Report cards are due! Teacher is wishing she had the flu. The weather impinged upon Barbara, and she isn’t so happy about it. Closed school? tacking snow days to the end, OH NO! Ben B. once again weaves wit with words. At a free seminar on one Adam Smith. Karen prefaces her poem with the following thought: This couplet is about something that’s been on my mind for a few days. Is it a lion or lamb, and how will it go? And Aram made a discovery of the unpleasant kind. Her poem surprised me, so deep, so gifted. One google later, I found it was lifted. Aram adds: That’s how it goes, lately, Kevin. Sue is waiting for the tube to catch her class. if our local news station will be covering their podcasting on TV! but no matter what I do, I stay at mediocre. “You’re the hardest teacher here!” said a student. And Bonnie was the reluctant poet this week. Reluctant, but brave. Snowstorms last weekend, floods today. And Mother Nature just keeps on laughing away. Next week, the host of the roving Day in a Sentence will be Anne M. from Australia, so be on the look-out for that announcement and join Anne on another writing adventure. How is your day going? Your week? I invite you to join our community of short-prose writers in the Day in a Sentence and boil down your week and share. (see archives) This week’s twist comes via a suggestion from one of our regulars, who asked that we try a couplet. If you want to podcast your couplet, even better. You can either provide a link in your post or you can email me your audio file and I will host for you. Send the audio to dogtrax(at)gmail(dot)com. Be part of the writing community! Everyone is welcome! How many times can I shout: stay focused on your work! before the kids begin to whisper, Mr. H has gone berserk. Last week, as part of the Day in a Sentence feature, I asked folks to take a quick survey that I had set up using the new Google Forms feature. There were 19 responses, which I think is pretty darn good turnout (thanks to everyone who did participate). Side Note: This week’s Day in a Sentence is being hosted over the TeachEng.Us site. 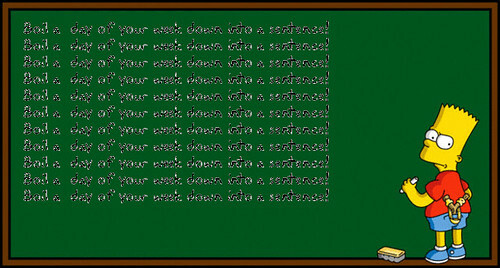 Please wander over there and submit your sentence. We would love to have veterans and newcomers alike share their insights into their weeks. I was pleased that there are so many regulars, although I realize that many people put on their writing hat when they have time and space for the reflection. You can see that we had a few who were very new to Day in a Sentence and we heartily welcome them in. You can see that so many of the writers are open and ready to try any format that we throw their way. I love that we are so flexible and willing to try new things. But there is still a desire for the traditional sentence and I support that, so we will continue to toggle back and forth between genres. I like the concept of creating a community of writers and teachers. I love the challenge and the community! It’s a way to reflect on my week and make connections with other teachers at the same time. It is interesting and fun to try and capture a moment or think in such reductive terms. I think it’s important to contribute. If you don’t, you have no right to complain about there being nothing good to read out there. It’s a challenge to compress my hectic days and weeks into just one sentence. The analyzing of my life and then putting it in writing often helps put things in the proper perspective. Also, it makes me find the time to write and share because I have an authentic audience. All too often I ignore the urge to write and then my ideas just float away into outer space. 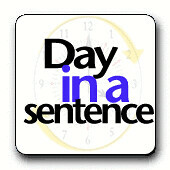 Participating in Day in a Sentence helps me capture my ideas and feelings. I liked the option for creativity and the chance to let my voice be heard. I like the challenge and I love reading what others come up with. Nothing better to do. Collaboration can’t be beat. Kevin is cool. I like to write. To take up the writing challenge and share it with an growing community. I participate because I like being part of a community. That is, I enjoy reading what others have to say and believe I have an obligation (a happy obligation) to contribute. I like the connectedness and reading other people’s comments. I am no good at haiku but I like all the other formats that could be and have been offered. I like reflecting on my week and I love reading everyone else’s reflection. I also enjoy being able to find out more about each person that contributes. Why not some more esoteric English terms, like synecdote, etc. Your week in iambic pentameter? I think it might be interesting to have us write in a sentence about a challenge we had during the week. I am sure we have many from which to choose. The other prompt might be a funny mistake or pit fall of the week. Here again, I bet we have more than a few to share. Thanks again to all of the people who took a few minutes from their busy day to answer my questions. So please, head on over to TeachEng.Us for this week’s prompt. Meanwhile, I decided on Monday that I wanted my students to do some blogging (we were just back from a week vacation and I wasn’t quite ready to go full-bore into paragraph writing). I thought, I should have them write about a day in a sentence and then post on our classroom blog. So we did. It was interesting because so many of them (I have 80 young writers) write so literal that my coaxing to get them to get at the “essence” of the day seemed to be a flop. I wish I had had a better explanation or plan. They definitely enjoyed the writing and the posting and the reading of everyone’s sentences, so it was worthwhile. This week’s Day in a Sentence became Day in a Simile, and everyone was wonderful (again!) with their entries. There is such a thrill to peak into my moderation bin and see all of the submissions and know what great quality writing and reflection is going on in your lives. Flowers to everyone this week! Yep — been there, had that, Larry, although not two new in one day. The Great Thaw is on the minds of many in the winter regions, including Michelle, a friend from the National Writing Project. Illya had a hill to scale but conjured up breakfast for a simile. Ben B. was a bit, well, literary in his submission. Let’s hope his week ended better than it began. Janelle is seeking tasty treats and new terrain. Ann O., a friend from the Twitterverse and Delicious network, is new to Day in a Sentence and I welcome her words and her presence. Eric compares his day to a movie and maybe he has some major stars lined up for the parts? Karen is all about variety this week. Alice‘s sentence comes via Tumblr, a microblogging application that I have not yet ventured into (just starting to Twitter, you know?). She had a terrible day and she had to recast her original entry (a bit of profanity filtered in) before settling on this culinary comparison. Donna was playing some virtual “red light green light” due to weather conditions and the cancellation of many events in her life. Sara’s blog detailed her sick week with the flu (sounds like my house). Ouch! Dentist simile coming up from Cynthia. Bring on the laughing gas! Tina, who is part of my Western Massachusetts Writing Project, composed her simile late at night, she says, and as vacation week was winding down. Elona found her week in a jar in the cupboard. Thanks to everyone who submitted a sentence. Next week, the Day in Sentence (in its traditional format) will be hosted over at the TeachEng.US site that Ben has set up as a collective resource for classroom teachers. He is always looking for new writers, so feel free to peruse the site during the week and give him an email holler if you are interested in contributing. NOTE: Ben has a classroom photo contest going on and you can get more info at the site.